After barely eating at Supper, we needed some genuine sustenance before heading out to National Mechanics. 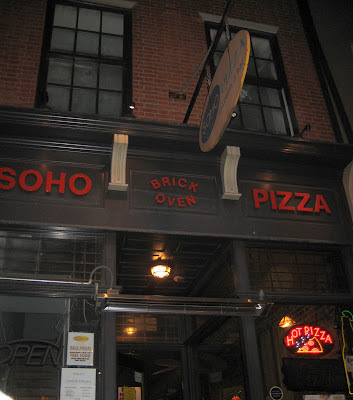 So we quickly grabbed some slices at Soho. It’s in old city on Market. You see a lot of late night activity here. I think the last time I ate here was super late. They’re open til 3:30! 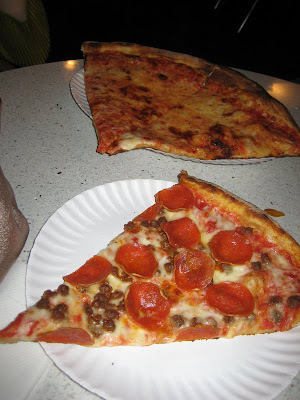 R got a couple slices of plain and I went with pepperoni/sausage. They didn’t have plain pepperoni or plain sausage. It was a winner. This is perfectly good pizza to fill your belly. The crust is nice and thin and slightly crunchy. The sauce is good. It’s nothing extraordinary, but it’s a nice fairly cheap slice that you can grab while in this neighborhood. If available, there is nice outdoor seating up front. Just be wary of the very aggressive homeless people.